“When are you going to get a proper job?” is a question that has been asked to me for most of my adult life. Mostly from my mother, but the question was also heard from well-meaning family members. (Of course it was said in a joking manner but I am 100% sure that the belief was, at that time that I was wasting my life by not pursuing a “normal career.”) Coming from a family of teachers, Lawyers, Hoteliers and Engineers to name a few industries, I still think to this day heading into the Scuba Industry was not a respected profession by the people around me. However, saying that, that very same mother who would question me about a “proper Job” would also always remind me of the fact that you only get one life and you need to live it. I was blessed that my mother never tried to hold me back from anything that I wished to pursue. However, believe me or not, I didn’t consciously set out to enter the diving industry on a full time basis. Becoming a scuba Instructor was merely a way to increase my qualifications, which was going to escalate my employment opportunities when I was looking for a “Real” job as a School Physical Education teacher. Now, its 15 years later and I still have not got that “real job”! There are as many reasons for why for people learn to dive so it is impossible to list them all. Some activities seem to be perfect precursors for scuba diving. Active swimmers take to diving pretty easily. People who enjoy snorkeling also have an advantage. They have already seen some of the fish life beneath the sea and so are “hooked” already. Snorkelers usually have an easy time transitioning to scuba diving. People who currently enjoy active outdoor activities are also the type of persons who are drawn to scuba diving. With its increasing popularity, scuba has become “fashionable”. Take a look at the holiday section of most magazines and you will see the “him and her picture perfect” fully kitted out in neoprene and wearing scuba equipment whist walking along a lush white beach with palm trees in the background. Scuba diving is reaching a pinnacle in media pop culture. Scuba Diving has moved from an activity for a select few adventurous individuals into a global recreational activity available for all the family. 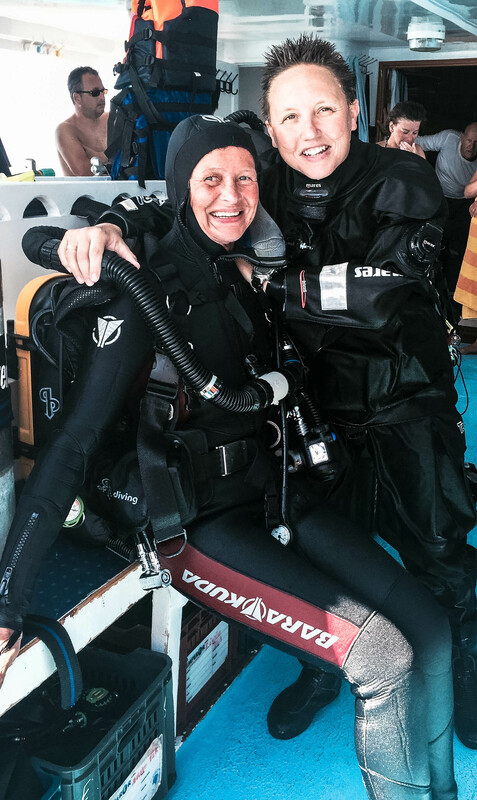 Nearly half of all new divers are women and it is also used as non-discriminatory therapy for physically challenged individuals. Diving is no longer a sport for daredevils; it has become a lifetime activity that you can enjoy with your friends and family. It’s a means to learning more about the beauty and intricacies of life on our planet. Why consider becoming an Instructor? Teaching is a challenging job with many unique frustrations, but the rewards of teaching are unquestionable. Instructors get incredible joy in seeing the difference they make as students gain new insights, become more interested in a subject, physically develop skills and learn about themselves. As an Instructor, you see your efforts everyday as you use your intelligence and creativity to help students become excited about and learn about the scuba diving world. For many people, their work is a means to an end. They work for a paycheck in order to live their lives. But those called to teach have a true vocation. To those with whom you interact most during your day of teaching – the students – you are not an employee but a friend, a mentor and a guide to the world. An Instructor makes a difference in the world by enabling each of his or her students to fully maximize their talents, skills and character. Being an Instructor is a job that offers a great deal of variety. Each day or week, instructors get to work with a new group of students with unique personalities, experiences and ideas. 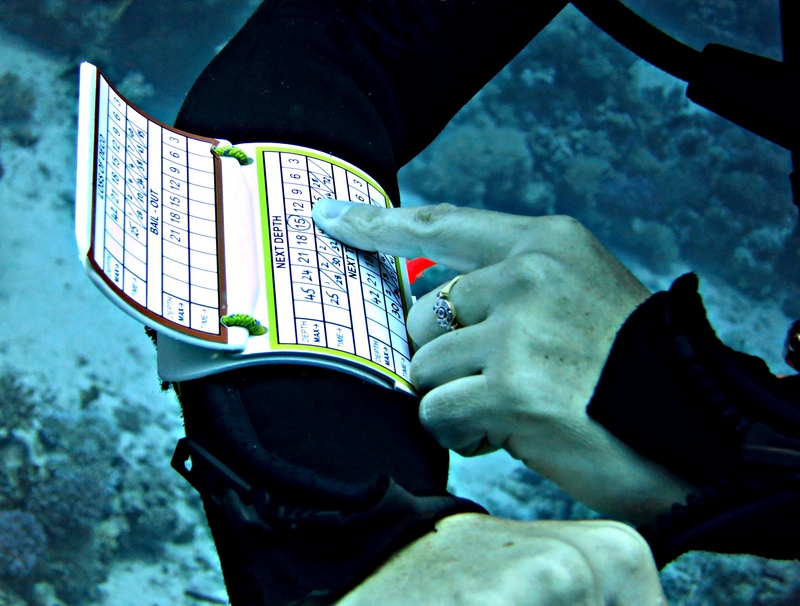 While scuba classes have mandatory standards that instructors are expected to follow, it is the instructor who will decide what will happen in the lesson. Not many jobs provide an individual with so much room to be creative and autonomous each day. Additionally, you will never learn a topic better than when you start to teach it. Students always ask the most interesting questions, prompting you to dig deeper, explore, investigate and learn more about the aspects of scuba diving. Over the last 15 years, I’ve had the pleasure of training scuba divers of all ages and backgrounds. So I can tell you with all honesty that being a scuba instructor is one of those jobs you enjoy doing every day of your life, if it was not the case I would not still be doing it! But, believe it or not, having fun just isn’t enough, because after awhile, even having fun can get boring. What has continued to motivate me over the years is the challenge. What other activity allows a teacher to deal in subjects as diverse as physics, physiology, marine science, mechanics, physical education, psychology and even public relations? You also have to have some pretty good counseling skills. Scuba instructors bring a whole new meaning to the term “jack-of-all-trades.” Our job believe it or not is at times very tough, demanding and often unappreciated, but it’s never boring. To the outside person, the Scuba industry is full of young guys and girls running around in the sun with perfect tans, making a wetsuit look good and swimming with Dolphins in tropical warm waters. This, unfortunately, is a delusion and mistaken belief. Becoming a Scuba Instructor isn’t easy—and neither is actually being one. But remembering why you go into this industry in the first place helps to stay focused when those challenging days come around, and take pride in your successes. I will emphasis at this point that teaching is a passion, not a paycheck! If the idea is to make loads of money, then this is not the industry for you! It’s incredibly hard work but, it is the most rewarding job out there and every day is different. Is being an instructor for me? Now, as much as the life of a Scuba Instructor has many benefits it for sure is not a suitable path for everybody! In fact, you may not be cut out for it at all. A scuba instructor has to enjoy and be capable of working with a wide range of personalities and circumstances. If your only motivation to become a diving educator is that you love diving, then forget about it. People skills are just as important and often more so than diving skills. Patience is perhaps the most important requisite; and a close second is flexibility coupled with the willingness to work long and highly irregular hours. Effective communication and human relations skills are as essential as diving skills. What’s equally important is a professional appearance and demeanor. Scuba Divers are sophisticated travelers. The last thing they want to see after spending a good chunk of their paycheck is to visit a dive destination is some beach bum in a dirty T-shirt. They put their lives in our hands, so they expect someone who can instill professionalism and confidence. The issue of responsibility is important to both understand, accept and cannot be ignored. Regardless of how much fun it may be, you can never take the responsibility of the instructor role lightly. If you do, people can die; it’s that simple. This can be a harsh realization, and anyone who lacks the commitment or maturity to accept such duties shouldn’t even consider the instructor route. Preparation to become an instructor requires mastery of diving theory, which includes a thorough grounding in diving physics, physiology, equipment mechanics and even a little marine science and oceanography. You’ll also need near-perfect diving skills, and an ability to deal calmly with stressful and unexpected situations like entanglements or out-of-air emergencies. In terms of physical prowess, you will be expected to complete watermanship tests to prove your physical abilities in and on the water and that you hold a minimum level of physical fitness that is expected of an infidel in a responsibility role. to be able to work for one of the most reputable scuba diving operators who not only supported their instructors in the work place but also encouraged us as instructors to continue training and always strive for the next level whilst maintaining high levels of standards and service. 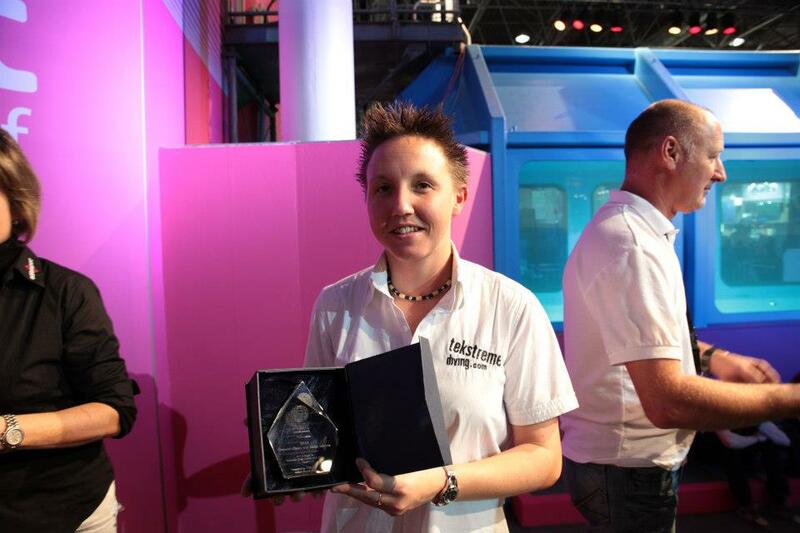 Over the years I have continued to develop my personal skills and have learnt the scuba diving industry as a business. This has had a direct effect on the growth of my own scuba diving company and subsequent future scuba diving ventures. I now look to the future and see continued personal growth for me as an Instructor Trainer and scuba diving ambassador. I can think of nothing better than to open up this amazing industry to others who could take inspiration from me and look to also becoming the scuba instructor. Deco schedule Decals, what do we think? When the European summertime comes to an end and Christmas would be fast approaching take a final chance to escape to the warmer waters of the Red Sea for some scuba diving action. In November 2015, Emperor Divers will be offering back to back trips to visit the northern wrecks and reefs of the Red Sea and have very kindly offered Tekstreme the opportunity to invite trained decompression divers to join the boat. Tekstreme will provide a guide for divers wishing to enjoy a safari trip made up of non-deco dives and deco dives. These trips are also the perfect opportunity for divers onboard the boat who currently do not have any decompression qualification to take the first level decompression course and maximize their times diving on some of the most amazing wrecks that the area has on offer. The SSI Extended Range Nitrox (SSI XR Nitrox) course enables you to continue to use your current scuba diving equipment whilst you learn the basics of decompression diving. You will be trained to dive to 40m utilizing eanx gases up to pure oxygen for decompression. You can do home study for the short course before hand, at your convenience, leaving the most enjoyable part of the course, the diving, to when you are on the boat with us. The Wrecks and reefs trip is the best of both worlds, where you visit famous wrecks in the northern Red Sea along with some stunning reef diving. This trip is not about depth, but it’s about having the time to explore the wrecks and reefs in all their glory within the 30 – 45m range. Abu Nuhas has four well-known wrecks: Ghiannis D, Carnatic, Chrisoula and Kimon M. All wrecks offering spectacular dives and plenty of fish life, and how about to try diving all four wrecks in one dive! Night dives can be superb as Gubal Island offers protected anchoring for the night. A small wreck at 8-10 metres makes for a spectacular night dive with lionfish, scorpion fish and its resident giant moray eel as well as the wreck of the Ulysses. The wreck of the Rosalie Moller is a perfect example of where having some decompression training can transform a dive. Imagine not being stuck to having only 20 minutes on the wreck before decompression but to be trained to happily have 40 minutes instead! Now we are talking! Next onto the Kingston lying at Shag Rock; the Carina lying close to Sha’ab Ali and the Dunraven at Beacon Rock in Ras Mohamed National Park. Last but not least lets not forget the most famous wreck in the Red Sea, the Thistlegorm, at Sha’ab Ali. The SS Thistlegorm was sunk in 1941 after being bombed by the German Luftwaffe while on a mission to deliver a cargo of ammunition and other war materials to the British troops in North Africa. The Rosalie Moller, carrying a cargo of coal, suffered the same fate just two days later. Many divers have yet to explore the wreck and the surrounding debris field in all its glory again because the computer says “no”! This does not have to be the way. During your SSI XR training you will learn how to combine the best eanx gas for deeper exploration, in combination with an efficient decompression gas to enable you to be the first in the water and for sure the last out the water! Whilst in Ras Mohamed, you may have the chance to do a dive at Shark Reef; a sheer wall falling into the blue. From here the boat heads back towards Hurghada. In between wreck dives you will also visit the reefs of the Straits of Gubal, Gulf of Suez and those to the north of Hurghada. A variety of deep walls and hard coral gardens with an abundance of reef fish make them well worth a visit. All wrecks are subject to divers’ experience and weather conditions. 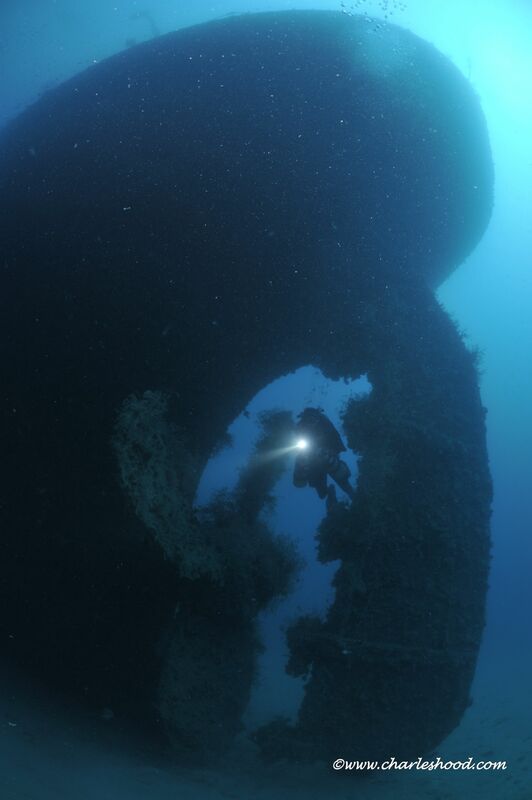 As a special winter deal Emperor Divers are offering either of these trips above for 899 euros. There are no minimum requirements in terms of how many divers would like to make decompression dives. One of our guides will be there even if there is only one person who would like to make decompression dives! There does not get better service than that! Contact us for reservations or more information. Did you know, that one of the most common questions that I get asked when guests are enquiring to me about Tekstreme and wanting to do some diving with us is, “Are Tekstreme located in other countries?” To date, I have had to reply that the answer is no. Tekstreme have, since establishment, concentrated their time offering technical services throughout Egypt. As a technical company we are one of the largest in Egypt with operations, through the facilities of Emperor Divers, in Sharm El Shiekh, El Gouna and Marsa Alam plus offering multiple specific technical safaris throughout the year. I guess personally for me, before taking Tekstreme to other destinations I want to be sure that we have the right attitude, approach, business plan, commitment, audience and of course the desire. Right now I believe we can easily tick all of those boxes. However, these things are not to be rushed. Much research needs to be done on destinations, availability, profitability, demand etc etc. We see in our industry too many technical operations opening up around the world yet one year later they close their doors. As a reputable technical diving company we need to ensure that if we take on such a project outside of Egypt that our customers can be assured that we will be there to stay. Now don’t get too excited, this blog is not Tekstreme announcing a new location, not quite yet, but what we are doing in the meantime is to take Tekstreme “On Tour”. Beginning in 2016 we are going to be offering technical diving trips to multiple other locations outside of Egypt. This way, our customers who want to have the benefit of diving multiple locations, but staying with Tekstreme are going to be very happy. Tekstreme will be organising diving trips including accommodation in various European destinations to begin with, before expanding to worldwide destinations. We will only be using the facilities of highly reputable dive centres in each location who we know will maintain high standards that our customers demand. On each trip one of our highly trained technical team members will be there with our customers to ensure that our high standards are kept and of course to offer technical courses on each trip. For each trip, we are keeping them quite exclusive, small groups only. We plan to take a maximum of around 8 – 10 divers on each trip. For us, it has always been about quality, not quantity and this philosophy will not change. We want to have a more intimate group of divers that we can care for on a personal level, rather than a conveyer belt of divers! For us, these are really exciting times and we cant wait to take kick start Tekstreme “The Tour”, we hope that we are going to see many of our technical diver friends come and join us and make this the best technical tour ever. SSI, Mares and an interesting end to the year. Can anybody explain to me where the last 4 months have gone as I cant! One minute I am teaching courses in 30 degrees water looking forward to the world cup football to begin and the next thing I know Christmas decorations are up and we need to use the heater at night time! The second part of the year for me has been quite exciting. I guess one of the things that stands out the most for me is to receive an email from technical instructor Paul Toomer requesting a meeting somewhere on the out skirts of London. As it happens I happened to be heading to UK and so agreed to meet him. All I knew was he wanted to try and sell me his new product some thing called “SSI TXR”. In all honesty I was not so excited about this, why would I be, its just another training agency looking to increase its numbers and how can they achieve that by trying to recruit Tekstreme who is one of the largest technical training companies in Egypt. Makes sense really! What I was not prepared for was to be shown the new materials that he had written. Now you may think what is so special about another technical diving manual? Well, it seems as though these people in SSI have recognised the digital era that we are in and designed manuals specifically for viewing on tablets, Ipads etc . My husband has taught me, and is continuing to teach me about the wonderful world of digital technology and so of course it immediately got my attention. The layout was clear, the text informative but not overbearing and the structure of the manual was progressive and an easy read. But lets face it, there is more to a training agency than just the manual, now for the important stuff… the courses. There are not so many different ways that technical courses can be done, ultimately you start off shallow and you end up deep. You start of with one tank and further down the line you end up with 6 tanks! What was a key factor for me was how can we as the instructor teach the course. This was what was enlightening. We “as the instructors” were actually allowed / given the opportunity to use our judgment and experience to enhance the teaching process. Ultimately there are a set of standards that the agency wants us to adhere to, but within those we had the scope to vary training depending on conditions and the level of students. Paul was very passionate about this range of technical courses and it was nice to spend time with a fellow instructor who is actively looking to continue to improve our industry. Moving forward a couple of months in the year was when we heard some strange news. SSI were being brought by Mares. This immediately concerned me. Since the meeting in London I had spent a lot of time with the guys from SSI helping to organise staff crossovers, creating SSI events to increase awareness of SSI recreational and technical courses, helping them out on the SSI stand at the dive show for a few examples. A lot of time and effort had gone into this partnership and then they simply sold themselves out! You can’t help but think that it is just for the money and now SSI wont care! No sooner had these rumours began that Karim Salah who is responsible for SSI recreational training in Egypt spoke to me to reassure that my concerns were not needed and that this move was going to a positive feature. This move by Mares and SSI is probably the most innovative and unique partnership in the diving industry. Towards the latter part of the year SSI and Mares announced that they would host meetings / events around Egypt to bring everybody up to speed. Once again I was dubious but attended the meeting to hear things as they say “from the horses mouth!”. Robert Stoss opened the meeting. Robert is one of the founders of SSI along with Guido Waetzig and admirably has a level of energy and passion that makes you want to listen and spend more time around him. For sure this guy is not done with the diving industry yet! By far the opposite, he is driving the digital revolution of training forward, helping us as the service provider be able to provide to our customers with greater ease. Secondly, we were introduced to Dusan Runjajic. Dusan, or Dusko as he is more well known is one of the top dogs within Mares and is a man with equal to, if not even more drive than Robert about his products and the new venture. An engineer by trade he has truly made his mark with Mares. Mares has become a worldwide leader in the manufacturing and distribution of state of the art diving equipment. The constant investment in innovation, patient research in the field of manufacturing materials and processes, combined with the expertise of the staff and professional approach gives Mares its leading position. Mares actually makes up part of the larger “Head” group. “Head” Company is a leading global manufacturer and marketer of branded sporting goods serving the skiing, tennis, swimming and diving markets. Dusko then outlined for us the relationship between Head, Mares and SSI. Now, normally through presentations like this I tend to switch off after a period of time, as you tend to hear the same things over and over about how good their product is above everybody elses. But this was not the case, I found myself 2 hours later still eagerly listening. These guys from Mares have actually designed a range of equipment for the dive centres to make our lives easier! The presentation was good and the recreational equipment is great but what about my greatest passion, tech diving, tech equipment?! I had some time in between this event in Egypt and the DEMA dive show in America to have a think about a few things. The passion, drive and energy from all these people that I had met at SSI and Mares was astounding and I only knew that I wanted to be more involved. It was a breath of fresh air to find in todays diving industry a group of people with similar future ideas not only about business (which of course is fundamental) but about moving the industry forward in unique ways. The product line by Mares currently does not have a well known reputation in the technical diving world but what I can say is that I personally and Tekstreme will be helping in whatever way we can to test new products and aid the development of Mares technical diving equipment. We will be continually teaching SSI technical courses to show case the new products as they emerge and to increase awareness of the brand in the technical arena. All I can say is watch this space….. Many thanks to Guido, Robert, Dusko, Adam, Karim, and Tarek for all of what they have done for us in 2014 and we really look forward to 2015. Note 1 – Paul Toomer is no longer with SSI. His role in SSI has been taken over by Adam Wood who is a gifted and professional technical instructor and who has already shown his commitment and will continue to drive SSI TXR where Paul left off. 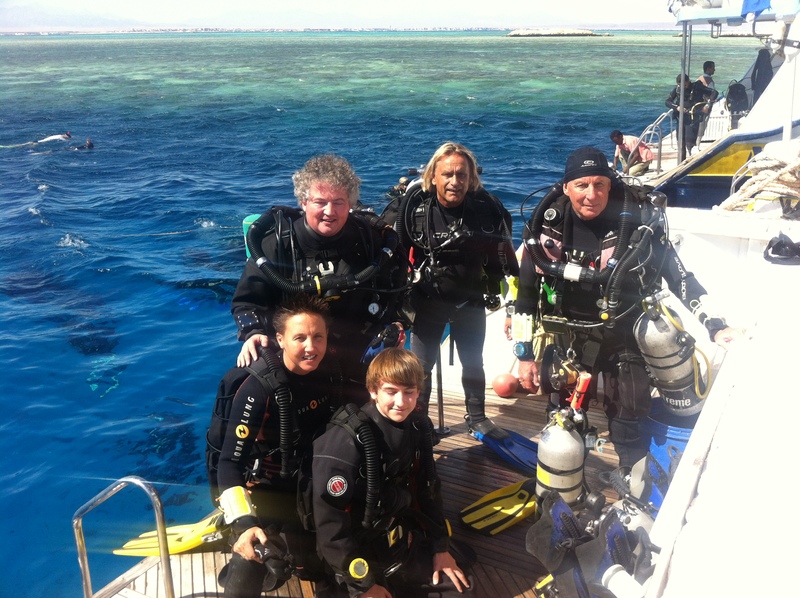 Who is the leading PADI TecRec dive centre in Egypt……Tekstreme Diving is! The new year could not have got off to a better start than to receive a phone call from Reto Moser, the PADI regional manager for Egypt, to inform us that Tekstreme had the most PADI TecRec certifications in Egypt in 2012. What an awesome achievement. This achievement is only possible due to great team of PADI TecRec Instructors that we have here at Tekstreme. The technical manager of Sinai Chris Armstrong, along with Duncan Spenceley and Steve Parry continue to provide thorough, safe, fun packed PADI TecRec courses which keeps our customers returning back to us. 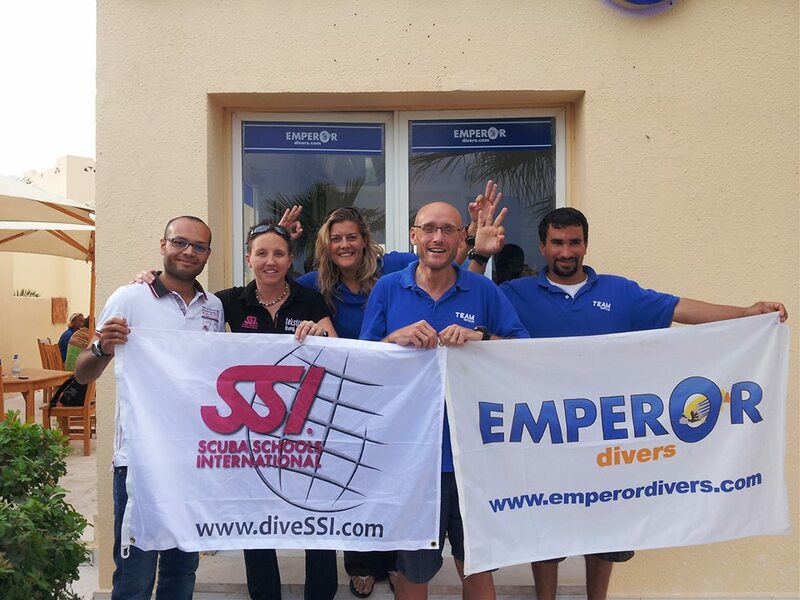 Now we would not be able to offer this level of service if it was not for the fantastic work of Emperor Divers. From the very first email reservation enquiries, to the quality of the dive centres, the boats, the transfers etc it makes for a complete high quality package. 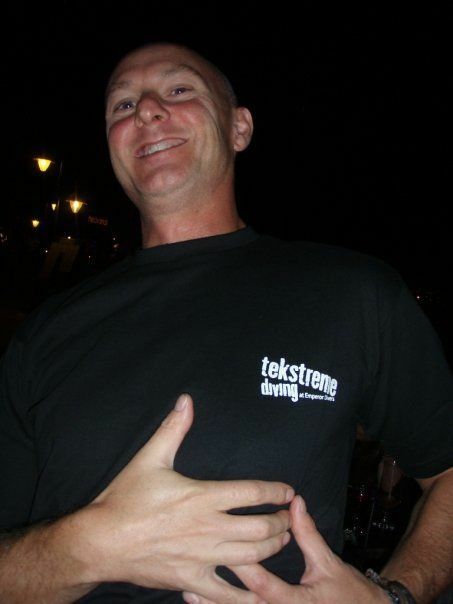 If you would have come to Tekstreme four years ago you would have struggled to find any reference to PADI technical diving courses, so what has changed? Why are these courses now so popular? The PADI TecRec debuted in 2000 with the launch of its Tec Deep Diver and Tec Trimix Diver Programmes. Although TecRec is not the first tec diving program (cave diver training has been around for decades), it repeatedly receives accolades for its merits. TecRec courses are integrated into an instructionally valid, seamless course flow that takes you from beginning tec diver to one qualified to the outer reaches of sport diving using different gas mixes. 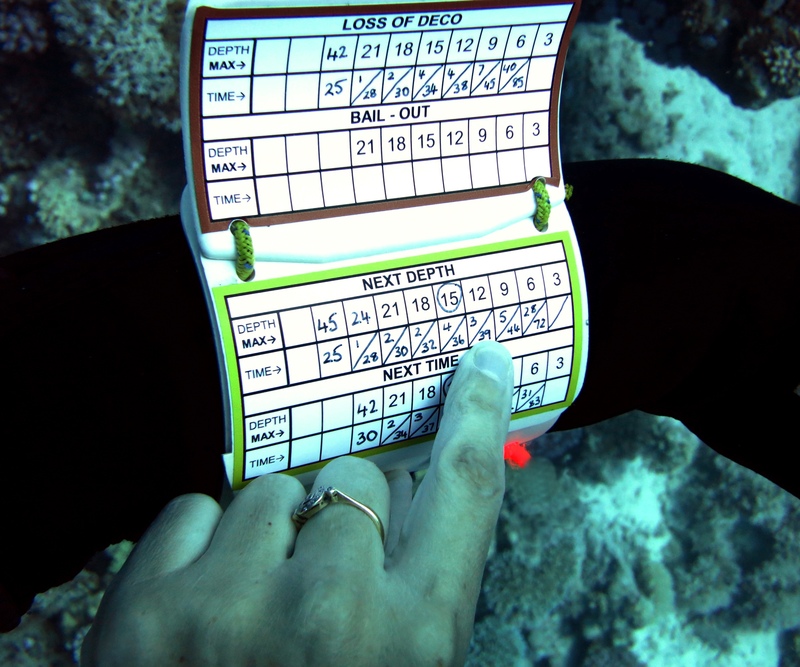 Each level introduces you to new gear, planning and procedures appropriate to extend your diving limits. 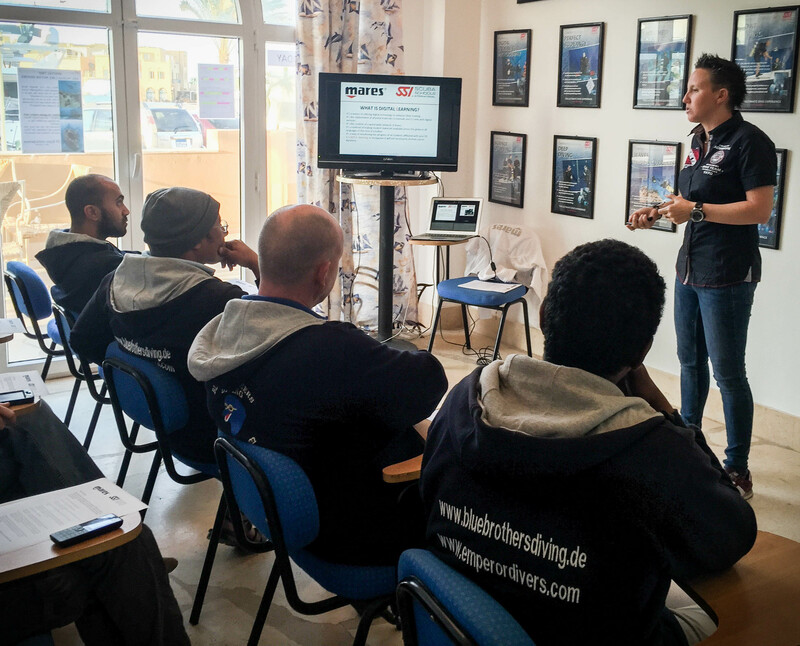 PADI responded well to the challenges that were presented against their technical courses and sought to rectify this problem; hence the breakdown of the Tec Deep Diver course and the Tec Trimix diver course. 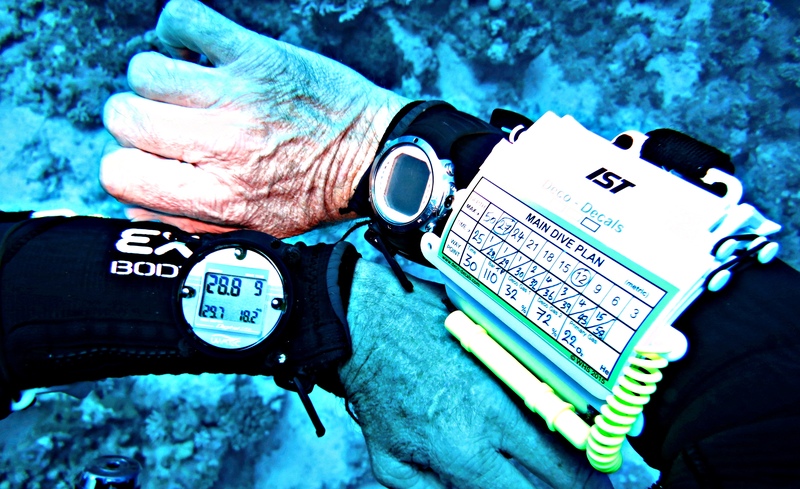 The Tec Diver course is now an integrated sequence of three sub-courses: Tec 40, Tec 45 and Tec 50. You can complete them continuously, or you can complete each level separately with a time span between them. This gives you learning efficiency, instructional integrity and schedule flexibility. 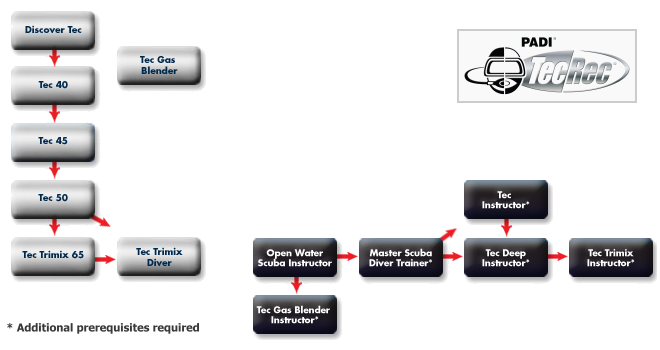 The Tec trimix course is also now an integrated sequence of two courses; the Trimix 65 and the The Trimix diver. Similar to the Tec Deep diver you can complete them continuously or you can complete each level on its own. 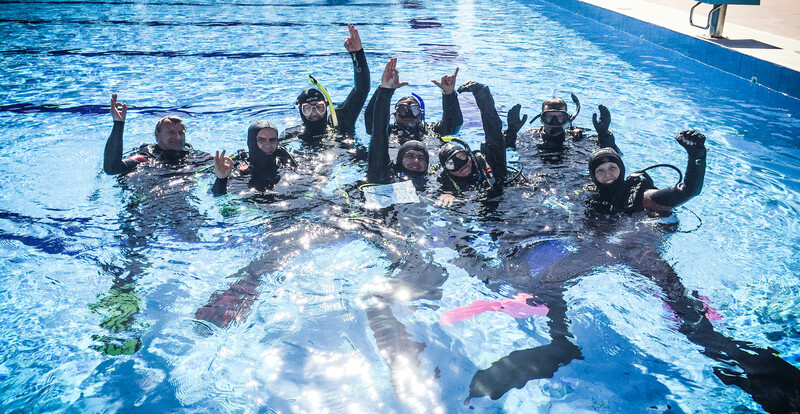 With these crucial changes PADI had created a much more use friendly sequence of courses that had a strcuture similar to other technical training agencies. Low and behold with a push on the marketing of these new courses the result was effective and immediate…the numbers of divers entering into the PADI technical training route was rapidly increasing. Tekstreme recognized the effort that PADI had made and responded by reinforcing the marketing for these new courses and look where we are now! I personally feel that not only are the PADI courses very thorough in their content but the reading materials that accompany each course are the best in comparison to other training agencies. Now yes, I do admit that PADI do love their multiple acronyms which some people are not a fan of, and yes, the manual does have a lots and lots of pretty colorful pictures, but from my experience as an instructor I can only report that these are beneficial to the learning curve of the student not detrimental. The manual is idiot prove, how can that be a bad thing! 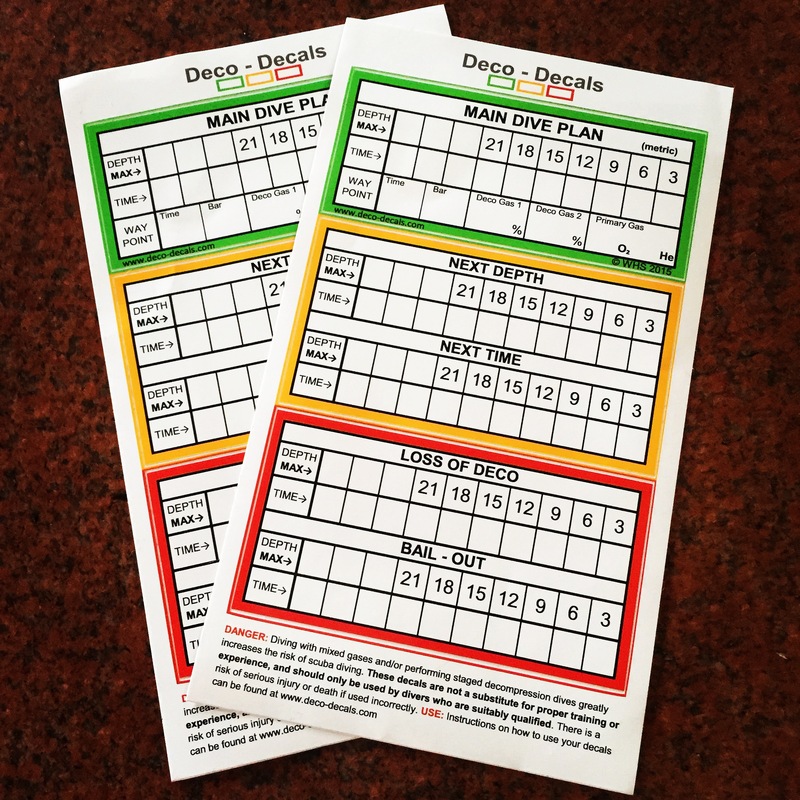 The other bonus is that the Tec Deep Manual was designed for the complete Tec Deep Diver course and so the result of this is, is that you only need one manual for the Tec 40, 45 and 50. I do think that in the future that this may change and that PADI will break the manual into three parts to go in partnership with the three sub courses, but for now you get the all in one. 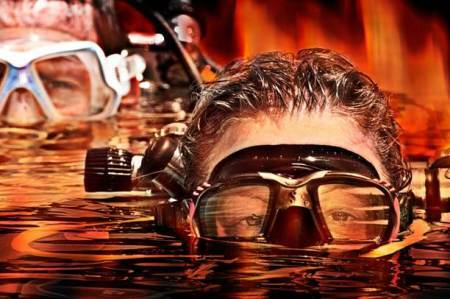 PADI have taken some criticism by many over their technical courses. Some people would categorize PADI as only a holidaymaker recreational agency and what place do they have in the technical diving world, but slowly this stigma is being overcome and PADI are standing up tall and defending their courses, as they rightly should. It has been a pleasure to join PADI on their journey of technical diving development and we can only hope that it continues to grow in the future. 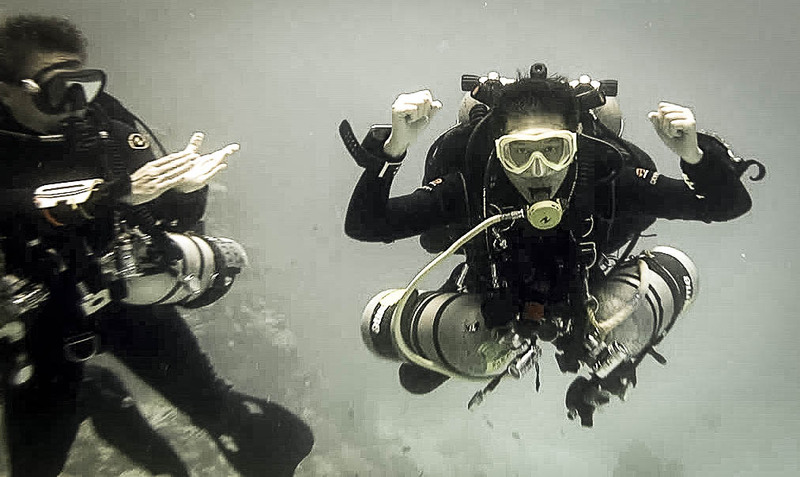 If you are interested in any of the PADI TecRec Courses then you can click on the following link http://www.tekstremediving.com/tecrec-courses.php or email to us directly at tekstreme@emperordivers.com. After a very busy ten days of evaluating and diving we are pleased to offer you courses on the Pelagian rebreather. 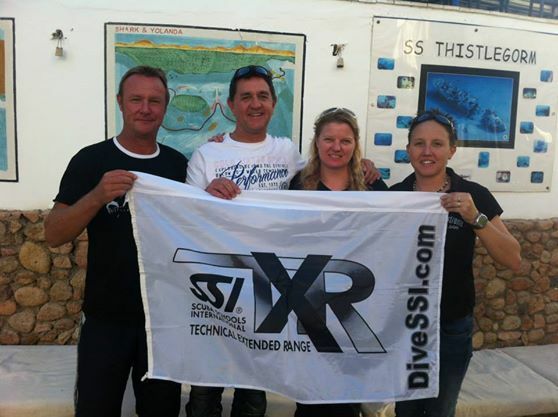 Andy Fritz who makes the rebreather came over to Sharm to show us his unit. 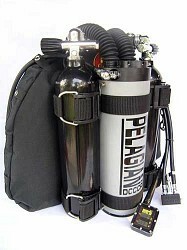 The pelagian is a Diver Controlled Closed Circuit Rebreather, in other words, a manual rebreather. It is similar to the Kiss except that you have a needle valve to determine the flow. This flow can be changed by the diver in the water. There is also a manual bypass that can be activated to control the Po2. The best thing about the unit is its weight. For the traveling rebreather diver this unit weighs in well below your travel allowance. With an empty scrubber and no cylinders with a normal backplate and wing you can put the whole lot into a bag and have a weight of 11Kg. Truly a portable rebreather. Tekstreme can now offer you courses on the Pelagian up to Mixed gas level. We can also order your unit and have it shipped to you without the bypass valve ready for your course. The bypass valve will be here waiting for you.